Launch your giant (up to 90 x 90 x 90 ft) inflatable billboard or logo into orbit with Russian Aerospace Systems. The company says (in Russian) that the service will be available as soon as October 2005. The objects will be seen from Earth as bright stars, with logos clearly discernable through amateur telescopes. They also say the project is licensed by the Russian Space Agency. In October of 1999, Pizza Hut has made a deal with the Russian Space Agency and Russian aerospace companies to have a 30ft tall company logo placed on the 200ft tall Proton rocket, at a price of $1 million. Here's the news and a pic. "This is one small step for mankind, but a giant leap for our Pizza Hut turnaround," said Pizza Hut in a press release at the time. 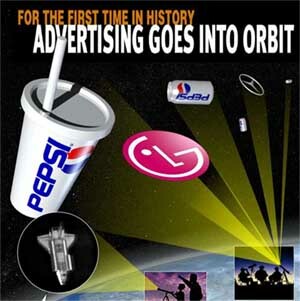 More on space advertising from back issues of Media Life Magazine, some assorted historical tidbits, and a brief history of space marketing from Space.com.